Edna “Lorraine” was born September 19, 1930, to Lawrence and Cecelia (Reinert) Waddell in Mott, ND. Lorraine and her family moved 35 times before graduating from St. Marys in New England, ND at the age of 16. After graduation, Lorraine earned her certificate and began teaching at Cherry Butte country school. Lorraine married Luke P. Jungers on July 10, 1950, in Regent, ND. The couple resided in North Dakota until moving their family to Stewartville in 1966. She worked as a clothing alterations specialist for many department stores in Rochester before starting her own business. Mr. Jungers died in 1988. Lorraine was active in 4-H, Friendly Neighbors Homemaker’s Club and American Legion Auxiliary. 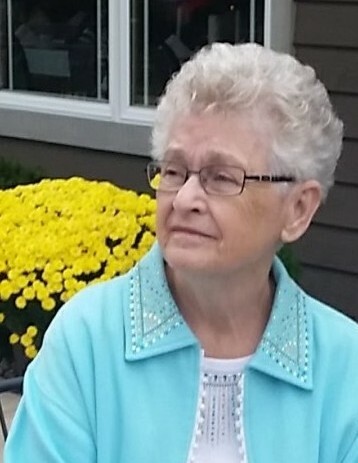 She was a longtime member of St. Bridget’s Church and was especially active in the church Prayer Group and Quilting Club. Lorraine enjoyed having Senior Dining at the Civic Center; she especially enjoyed being picked up daily by Grisim Bus Service. The family of Lorraine would like to thank her “Visiting Angel” Luann. Lorraine leaves behind to cherish her memory, 8 daughters- Susan Boswell of Rochester, Genevieve Jungers of Grand Meadow, Elizabeth Jungers of St. Cloud, Mary (Mark Peterson) Jungers of Pine City, Sandra Jungers of Duluth, Julie (Bob) Nathan of Cold Spring, Caroline (Jeff Herd) Jungers of Highlandville, MO and Amy (Dean) Den Hartog of West Bend WI; 3 sons Charles Jungers of Stewartville, David (Barb) Jungers of Annandale and John Jungers of Spring Valley; 12 grandchildren; many great grandchildren and 1 great-great grandchild; 1 brother- Jim Waddell of Washington and 1 sister – Karin Keyes of Lompoc, CA. She was preceded in death by her husband, Luke and 3 brothers. Visitation will take place from 9:30 to 11:00 a.m. before the service on Monday, April 15, 2019 at St. Bridget’s Catholic Church. Burial will take place at the Church Cemetery. The family suggests memorials to Stewartville Center for Active Adults. Arrangements are with Griffin-Gray Funeral Home in Stewartville. www.griffin-gray.com.